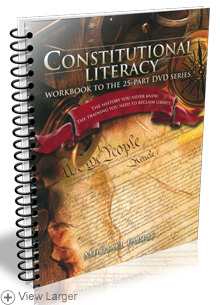 This high-quality spiral-bound workbook is the companion curriculum to the Constitutional Literacy DVD series. The workbook contains lesson plans, vocabulary, additional instruction, study questions, and writing assignments. On page 12 of the workbook there is a link to access the answers to all the study question. Dr. Michael Farris brings the U.S. Constitution to life for modern Americans by examining these questions: What does the Constitution actually say? What does it mean? What were the Founders' intentions for this document? And how is it being interpreted to shape our laws and way of life today? 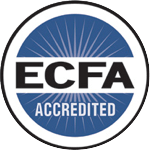 This may be the most important course your student (and future voter) takes this year. From Teacher of Wildwood, Missouri on 9/12/2018 . From Cheryl Robertson of Lakeside, California on 10/21/2015 . From Melissa of Eastern Shore, Maryland on 10/10/2014 . 7/22/2017 – What is your recommendation for taking iCitizen and Constitutional Literacy (using both workbook & DVD) both in the same . 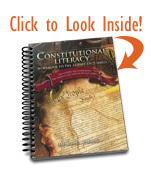 . .
9/2/2015 – Are there quizzes or tests available for the Constitutional Literacy Workbook? Thank You. 7/7/2015 – Is this course lacking content for a traditional US Government high school credit? If so what would still need covered? 4/7/2015 – Has anyone done an 'Intensive' course using this Curriculum? Let's say 2-3 weeks at 2 lessons per day in a co-op setting? . . .
8/30/2014 – Is it possible to see a few sample pages or table of contents for this workbook so that I can decide if I would like to add . . .
7/2/2014 – I have the first edition DVD's. Will this book coordinate with those as well? 6/24/2014 – Is this workbook coordinated with the 2nd edition DVD series?